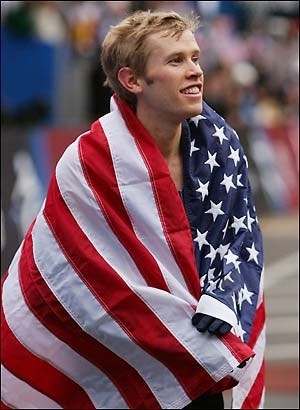 We’re proud to have Ryan Hall, a running champion and Olympic athlete, here in Big Bear, California. Hall made recent national news by placing fourth at the Boston Marathon on April 18 of this year. Hall was born here in Big Bear. He frequently tells the story of having a vision at the age of 14 while with his brother in their parents’ car. That day, he says, he saw his future as a long distance marathon winner. He began his running career soon after by setting off down Big Bear Boulevard and around our beautiful lake. After that first run, he went on to become California State cross country champion in his junior and senior year at Big Bear High School. Since that life changing run around Big Bear Lake, Ryan has become what some call “the most gifted endurance athlete the United States has ever produced.” (sharingthevictory.com). His recent Boston Marathon win at 2:04:58 placed him 4th and in 2007 he not only won the New York City Olympic trials by more than two minutes, he also broke the U.S. Olympic Trials record. Earning the U.S. record by placing first at the half marathon with a time of 59.43, breaking the one hour barrier. Setting the Mt. SAC course record in 2000. Earning the CIF California State Meet championship in the 1600 meters during his senior year. The next time you visit Big Bear we encourage you to take a stroll around the lake and think of Ryan making that first legendary trip. The next time you hear Ryan’s name, join us in cheering him on! Gallery | This entry was posted in History and tagged Big Bear CA, big bear lake, history, Olympics, Ryan Hall. Bookmark the permalink.